The London Foot and Ankle Centre established a second service at London Bridge Hospital in 2006. Located on the South Bank of the River Thames, and we are located in the Outpatients & Diagnostics Centre in the Shard building, on the fifth floor. 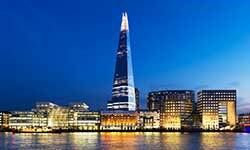 We are situated very close to London Bridge mainline and underground stations with easy access to the City. Please follow the signs for the Shard Exit from the platforms, and then along Joiner Street to St. Thomas Street. London Bridge Hospital is situated on the South Bank of the Thames. We are next to London Bridge mainline and underground stations with easy access to the City. London Bridge Station is serviced by trains from Kent and Surrey and offers direct connections to Charing Cross, Cannon Street, Waterloo East stations and Blackfriars. Trains also connect directly with all stations on the Thameslink line. London Bridge station is on the Jubilee Line and Northern Line (City Branch). We do not recommend you drive to the hospital as there is limited parking nearby. However, if you need to travel by car please visit the London Bridge Hospital website for directions. Please note: No right-hand turn can be made from Borough High Street into Duke Street Hill due to the one-way system. London Bridge Hospital falls in the congestion charging zone. To find out what it is, when it operates and how to pay, visit Transport for London or call 0845 900 1234. This is the number you will also need to call to register and pay to enter central London. The nearest car park is Snowsfields which is open all day, every day. The Euro Car Park next to Tower Bridge is open 8am-9pm Monday to Friday and 8am-8pm Saturday and Sunday.